We all know that more links = higher rankings. But building links isn’t always easy. So I am going to share 12x incredible link building strategies with you today. You can use any of these proven link building strategies to attract high quality links to your website quickly and easily! ….but you should only use 3x of them. Because it’s easy to get overwhelmed and do nothing. That will stop you from getting distracted & help you increase your search traffic in 2019! #6 – Guest Blogging – Yawn! With just a few minutes work you can create powerful homepage links to your website. …you can have your testimonial published with a link back to your website. Which includes a backlink to my blog. So let’s take a look at how you build links with testimonials. First, you need to find the websites for services and products that you could provide a testimonial for. So start by writing a list of tools/products/services you are already using in your business. If you’re struggling to come up with any ideas you could cheat a little bit. Look at what other tools and services people in your niche use…. You can also look for people in your niche who have just launched (or about to launch) products/tools/services. Usually they need/want testimonials to help with a product launch. Now we need to find the right person to contact. Sometimes you can just ask via the contact form on the website and some will even have dedicated testimonial submission forms. But if you’re doing more than a few of them, you should use a tool like NinjaOutreach to help you out. Then you can add each email address to your spreadsheet and start to contact everyone on your list with a pitch. First pitch them with the idea that they could have a testimonial created by you. I was just reaching out to say thank you for building #TOOLNAME#. I have been using #TOOLNAME# for the past 6 months and it has helped me 5x my results. Before I found your tool I was really struggling with #COMPETITORPRODUCTNAME# so thank you again – honestly it has really transformed my business. I would love to write a testimonial about my experience. Is that something you would be interested in? Just keep it short, simple and sweet. Writing the perfect testimonial is pretty straight forward. I would never expect that your advice could really help me increasing my search engine traffic rank. I am sceptical at first but my site arieon.my was able to go to another level where I get 30,000 unique visit per month in just 5 months. The best part is that your advice and tutorial is easy to follow. Hi Matt, Your online tutorials are quite easy to follow and replicate. I was able to double the organic traffic in many of my clients’ websites relatively easy in very short time. Keep up the good work. Write a testimonial that they would be stupid not to publish. Make sure what you write is true. You are attaching your name and recommendation to a tool/product/service after all. Using testimonials as a link building strategy is a fantastic way to build high quality homepage links. Link Roundups are blog posts that “round up” links to awesome content. This is usually done daily weekly or monthly and often includes a short write up. You can find thee types of blog posts in nearly every niche. …and then go through the results and add any suitable roundup sites to a spreadsheet. Repeat the search for each suggestion mentioned above. Find the contact email address for each site by using a tool like NinjaOutreach or FindThatLead. Or if you’ve got time search their site for an email address or contact form. …you need to do something a little bit different. I am a frequent reader of #INSERTROUNDUPNAME# – thanks for putting it together every #WEEK/MONTH/YEAR#. Looking forward to the next roundup! Thanks again for putting it together all the time! Once they reply, then pivot with your link pitch. Link Roundup Link Building is so simple and easy to carry out. Not only will you get a link, but you’ll likely receive targeted traffic as well! There are loads of blogs out there who regularly publish link roundup posts which you can take advantage of. Be sure that any content you pitch is top quality & adds value to their roundup. Most websites have a resource page where they list all the tools, guides and articles that they use or have found useful. This is in essence just a list of links with some added commentary. I’m sure you have figured out where this is going right? It really just depends on how much elbow grease you want to put in. But if you are doing this for the first time you should do it the hard way with Option #1 to learn the ropes. Just look through the results and pick any that fit your content. Add those to a spreadsheet and you’re ready for the next step. You will get a nice long list of relevant resource pages instantly. Then in just a couple of clicks you can automatically find their contact details and send them your pitch. The next step is to reach out to the website and pitch them your content to add to the resource page. Either contact the website owner manually or use one of the prewritten NinjaOutreach templates. It really helped me #INSERTHOWITHELPED# eg I was having a hard time wrapping my head around copywriting but having your central hub of resources really helped me overcome it. Especially the article with all of the different headline templates! Thanks again it was really appreciated! Just send that to each of your targets and wait for the reply’s. The more people you ask, the more links you will get. A simple, yet effective link building method is Resource Link Building. Find resource pages that relate to your article, tool, product or service and pitch to the website owner to feature your content. Give them useful evergreen content and earn a valuable backlink in return. Use Google and tools like Ninja Outreach to find prospects and pitch them your content. Internal link building is one of my favorite link building strategies. It is super easy to implement and carries very little to no risk of penalisation. An internal link is a link placed on one webpage that links to another webpage of the same domain. It means that we have complete control over them and the anchor text that we use. Internal links carry a lot of value and most people don’t realise just how much they help your SEO. This the most underused link building strategy in SEO. Because it’s very easy to implement! I’m going to show you the manual linking process here. ..but you’ll end up with a powerful internal linking structure and a dangerous amount of know how. However, you can still learn the other 2x easier methods in my Ultimate Guide To Internal Link Building. First up you need to make a list of your URL’s and the target keywords. Then use Google to search for posts on your website where you could add relevant links. Add your links and then repeat for each URL/keyword in your list. It might take a while – but I promise you it’s worth it. PRO TIP: Internal link building is not a set and forget process. You must be sure to add internal links from old content to new content every time you publish! If you want a quicker way to complete this step then take a look at my more detailed guide which includes a downloadable template. Use the manual internal link building strategy to have complete control over your link placements. And be sure to add internal links to each new post you publish from old content. One of my favorite link building hacks is to use expired domains. You should be wielding their power for your business. It’s like having an invisible army of authoritative websites all with the sole purpose of linking back to you. But the trick is finding relevant expiring domains that have authority in the first place. Because once you have one, there are so many different ways that you can use it to your benefit. Finding expired domains can be as hard or as easy as you want it to be. I have used every tool under the sun over the years and for me the best tool by far is DomainHunterGatherer. It will help you to find expired domains and pull in key metrics for you. What you do with an expired domain once you have found it is up to you. You can use them to build powerful backlinks or to build out a new site with instant authority. The power is truly in your hands with expired domains. Expired domains that have great backlink profiles are worth their weight in gold! Buying these domains and either building your websites on them or using them to create links is an intelligent strategy. Don’t ignore the power of expired domains! The funny thing is most people label guest posting as a white hat strategy. ALL FORMS of link building are against Google’s guidelines. All Google’s ranking algorithm wants to see is specific metrics. It’s your job to feed it those metrics. And guest posts will always work very well as a marketing function to build an audience and feed the algortihm the metrics it wants. Guest blogging isn’t what it’s used to be a few years ago. It’s much much harder to earn a genuine link placement in 2019. Most website owners have caught on and often want payment to place your guest posts. Which is nothing more than just a long winded way to buy links right? That’s not to say that guest blogging isn’t worth doing. Feel free to walk that line however you choose. The really easy way to do that is with NinjaOutreach that makes the entire process really easy. The first step to getting started with guest blogging is to find your prospects. These are the websites where you are going to publish your piece of content. Ideally, you want to publish in sites with high DA (domain authority) and high traffic. For example, let’s say you wanted like to publish a piece of content about tourism in London. Open Excel, and make a list of all the sites you find. With the list you have created, run each site through Ahrefs, my favorite backlink analyser, to check their domain authority. Take the first website in your list, and go to the Site Explorer. Once you are there, add the website you want to analyze and click on the orange loop icon. In the menu, take the number that you see in the center of the screen, under the DR sign. Add these numbers to your list and repeat the process until you have the DA of every site. If you want to get an approximation of the traffic the websites get, you can also run the sites in SimilarWeb. In there, add each prospect to the top search bar. Scroll down, and under “Traffic Overview”, copy the number that shows in “Total Visits” and paste it into your Excel sheet. With the list of websites, go to each site and contact the manager to check if they are interested in your pitch. I was checking out [SITE] today and found the guest post you published from [GUEST POSTER’S NAME]. I loved that article, I just shared it with my audience. Do any of these ideas look good? Let me know your thoughts. I highly recommend that you customise that a little bit and also take a peak at any specific guest post guidelines they may have. Once you get accepted, start creating the content. Its important to write with the blog’s audience in mind! If you need to dig into the site’s audience, read the comments from previous articles and check the posts that got the most shares and comments. He teaches everything he knows about becoming a freelance writer. And he holds nothing back! Once you finish writing it, send it their way. A great thing about guest blogging is that it helps you build relationships with the blog managers. Creating a network is important if you ever need help promoting a specific piece of content from your site and you want to publish often in a high-authority site. Even though the whole guest blogging process can be quite tiring, you can use automation to guest post faster. Nick Pierno talks about the importance of site authority and how you can build it in his article – The SEO Equation. One of the most overlooked benefits of guest blogging is the ability to open direct conversation with someone elses audience. If you do those 3 things alongside your guest post, you will accelerate your results. Guest blogging can take some time, and due to the amount of content you have to create, it can get messy. Then, qualify every blog you found to make sure you are pitching to the right place. Reach out to the right people using the template I shared as a basis. Send your guest post and get it published. Engage with their audience as much as possible. It can be a pretty long-winded process, but it is an effective one. To save time you should use NinjaOutreach your campaign. It will allow you to find, qualify and reach out to hundreds of blogs in just a few clicks. Most websites have hundreds, if not thousands, of links. Many of them link internally, while others do it externally. For whatever reason, these links can easily break and stop working. Most website owners don’t realize this when it happens, and it can break their user experience, reputation, and SEO. And I have broken links from an old a/b experiment where I didn’t redirect the test page! All of that makes this one of my favorite types of link building. Broken link building is the tactic Nikolay Stoyanov used to acquire 15 links in 1 day with a 15% conversion rate. It really is one of the most underutilized link building strategies in my opinion. The first step is to define the website where you want to get a link from. You can pick any website you want, but I’d recommend you be realistic about your expectations. The chances of getting a link from Inc or The New York Times after you find a broken link are slim to none. The best websites where you can get a link from are personal blogs and small companies. The owners and managers will be grateful for your help, and they will likely thank you with a link. Once you have created the list of the websites you want to get a link from, you need to start searching for the broken links. To do so, you can use two tools: Check My Links and Ahrefs. Check My Links is a useful Chrome Extension that finds for links within a specific page. This tool works great if you have a page with lots of links, like an article with a list of recommendations or a resource page. For example, let’s say you sold cooking tools. This page features a long list of tools they recommend. In this page, you’d click on the Check My Links extension and wait until the tool analyzes the whole page. Unfortunately, on this page, the tool didn’t find any broken links. It’s a good habit to search for broken links on every website you usually visit, so you become aware of the opportunities available. In every page you do find a broken link, you need to create a list where you add each link from each page you search. You will use this later on. If you find this process too time-consuming and prefer to search for broken links within a site, regardless of where the link is located, you can use Ahrefs. Ahrefs will analyze the site thoroughly and will make a list of all the broken links it has. To do so, go to Ahrefs’ Site Explorer and add the website you want to analyze in the main search bar in the middle of the page. Then, go to Backlinks > Broken. In this page, you can see all the broken inbound links the website you are analyzing got. This represents a massive opportunity to pitch the site that linked to the one you are analyzing to get a link from them. Export this list and save it to a separate Excel sheet. After you are done with this, go back to the left-side menu, and click on Outgoing links > Broken links. There, you will find all the broken outbound links from the site you are analyzing. You can use this list of links to let the website owner know about them. If the page they linked to still exists, let them know about it. After you do so, you can also recommend a similar page on your site that’s similar. Later I will show you a template you can use for this purpose. Just as you did before, export this list. Finally, you are going to find all the internal broken links. To do so, click in the search menu bar under Pages > Best by links. In here, you will find the list of all the internal broken links organized by its URL rating. This means, the higher a page is on the list, the more link authority it carries. Therefore, if you can get a link from a top page, you will get an important link boost. As you did before, export the list of links and save it on your sheet. Repeat the process for every site you want to get a link from. Once you finished analyzing all the sites and pages, it’s time to contact the blog owner or manager to let them know about the broken link. Your first goal should be to create a relationship and build some trust . If you have a page that’s relevant to the page where you find the broken link, then let them know about it. Don’t do it to get a link; do it to help them have a great page for their readers. If you don’t have something relevant to offer, focus on fixing the broken link at hand. It’s likely you will find more opportunities later on to ask for a link. I was searching for some information on [INSERT TOPIC] today when I found your [PAGE TITLE]. I liked it a lot, I already shared it with my Twitter following. By the way, I recently published something relevant to your [INSERT TOPIC with URL]. It could be a nice addition to your page. Send this template to every owner or manager you have found on every site on your list. You’ll be amazed at the types of responses you receive from people! The key to broken link building is finding the right sites to pitch, so to begin, start by picking websites that you’d want to get a link from. You can find the sites with the most amount of broken links with the help of a tool like Ahrefs, or you can just check case-by-case with the help of Check My Links. I prefer to use Ahrefs as it’s more scalable. Once you have defined the website you want to analyze, add it to Site Explorer. Start the analysis by clicking on Backlinks > Broken. The links you find in this page are former pages of the website you are analysing that don’t exist anymore, but that still get a link. You can use these links to pitch the linking website to replace it to one that points to your site. Then, go back to the left-side menu, and click on Outgoing links > Broken links. In here, you will find all the broken links the site is linking to. These links represent a great opportunity to ask for a link, as the website is basically linking to another site; this could easily be your own. The pages you find here are all the most important internal broken pages which the website you are analysing has. Another great opportunity for pitching. Once you are done with this process, use the template I gave you to reach out to the site. Your competitors probably spend thousands of dollars and hundreds of hours developing their link building strategies to and acquire high-quality links. If you have a small budget, why would you try to compete with those companies? You’d most likely fail to get the same quality of links your competitors get. Instead of hitting your head against your wall in anger and decide to work harder, you should work smarter. Spy on your competitors and steal their best backlinks. You are basically drafting with your competitors; they work hard to get links, you follow them and get the same ones. For example, Brian Dean likes to analyse his competitors’ backlinks to come up with similar but better pieces of content. Then, he creates a new and improved article which he then uses to pitch to the sites which linked to his competitors so he can also get a link. That simple tactic has helped him increase his site’s traffic and make it one of the world’s leading SEO sites. Of course, this is easier said than done, but if you do it right, you can get great results with little effort. Start by making a list of 5x competitor that ranks for a keyword you want to rank for. It doesn’t matter if they are bigger or smaller than you. They will all teach you some valuable lessons. Once you have your list of competitors, you will need to analyse their backlinks profile. You can download my intelligent spreadsheets that make this a really easy process. As you already know, my favorite tool for this is Ahrefs but my spreadsheets also work with SEMRush and SEO Spyglass. The analysis is simple: go to Ahrefs’ Site Explorer, add the link from one of your competitors, and click the orange loop button. In the left-side menu, click on the link that says Backlinks. In here you can see all the inbound links my competitor (in this case, a paleo blog) got. To make your analysis more interesting, click on the Link type button in the bar above the results. Here you can organize the links by those that are “follow”, governmental, educational, and editorial (i.e., those that are linked naturally within a piece of content). Let’s say I wanted to see the educational links my competitor got. These links show this competitor is respected within its industry. Also, you can see some educational sites linked to recipes, which shows interest in that type of content. Export the list of URLs you find for every competitor. Once you have found a list of inbound links, start by opening in a separate tab each link one at a time. From here, you need to start thinking. What did your competitor do to get that link? As you work through the list replicating links you’ll get a good feel for this process. You will be able to uncover new opportunities, get a feel for what people like in your industry, and see what type of content gets the most links. Reverse engineering is simple, yet it takes some creativity from your end. You want to know why your competitor got its links; your analysis will try to uncover just that. PRO TIP Download my intelligent sheets to steal your competitors best backlinks (and keywords) in minutes. Start by making a list of your competitors in the top 5 search results. Then analyse the backlinks with the help of my awesome spreadsheets. Or do it manually with Ahrefs, go to the Site Explorer, add your competitor, and once you have the results, click on the link that says Backlinks. There, click on the Link type button, and export the whole list of URLs you get. With this list, you want to open each link and figure out how and why they got the link. Ask yourself, is it because of the quality of their content? Is it because they offer something unique and valuable? You want to know the why behind the link. One of the key elements of any effective link building campaign is creating great content that stands out and commands attention. Creating content that has a higher likelihood of going viral, however, isn’t easy. Instead of wasting time trying to figure out what people may like, you can take what people are already talking about and use that as inspiration for your next piece of content. This tactic is known as “newsjacking” because you are taking advantage of a popular topic from the news and use it to create and promote your own content. A classic case of newsjacking is what Oreo did in the Superbowl 2013. This Oreo tweet got more than 15,880 retweets and 6,200 favorites in just a few hours. They also got a lot of press (and the links that come with it), including mentions in The Huffington Post, Wired, and CNET. You can use this same press to get links to your site. Research what people talk about with the help of Google Trends. You can put your own ideas in the top search bar and see their popularity, or write down the list of topics that show up on the homepage. The royal weddings, for example, represents a great idea for many articles, especially if you are in the design, beauty, and fashion industry. Go broad with your list of ideas; later you will analyse them in more detail. With your initial list of popular topics, brainstorm a list of content articles. You want both to have some relationship with one another. With your list of content ideas, define one that suits you best, and start creating the content fast. Time is your friend in here. The popularity of some topics lasts only a few weeks, if not days. Make sure to have the article done no longer than a week after you found it. Talking about a popular topic makes promotion easier, but it’s not a fool-proof way of creating viral content. As it always happens with content, focus on the promotion. Don’t promote it on social media alone; use it as a way to call the attention of people both within and outside your industry. Reach outside your industry. Using the previous example, you may want to reach blogs that talk about technology, business, Apple, and Uber. Newsworthy content always attract attention (and links). It’s really easy to do and there are new opportunities every single week! To find newsjacking opportunities, get to know what people are searching for with Google Trends. You can go deeper with the help of the categories section. With the results, brainstorm potential ideas that tie your expertise with the news. Create the content fast, and aggressively promote it. Remember, people like sharing content that’s new and unique; newsjacking can help you achieve just that. Similarly, if you play on famous people’s ego, the chances of getting links from high-authority sites increases significantly. First, you build relationships with people that manage high-traffic, high-authority sites. As you know, relationships are one of the key ways to get anything in life, including links. If you get influencers interested in your article, they will feel invested. Once you publish it, they will feel “pushed” to share and link to it, even if you don’t tell them. This is the basis of influencer marketing. Creating ego bait list posts (ELP for short) has helped get 2000 views to a blog that wasn’t even getting 50 visits per month. In the image above you can see the sessions went up 482%, while the pageviews increased 1382% and the users 624%. As I recommend on the ego bait list article, start with the headline, which sums up the idea of the article. Pick a list of influencers from your industry, and define the promise that your article will fulfill. You can pick as little or as many as you want, depending on how much in depth you want to go with each influencer. For example you might want to ask what everyone’s favorite link building tools are. That makes it easy for the influencers to know exactly what they are expected to write about. The audience will also appreciate a specific piece of advice they can use on their own. Even though you have already specified the main promise of the article, you want to define the question you will ask the influencers. Be specific and focus on one question only. Influencers are busy people, that’s why you want them to answer your question with the greatest level of detail possible. When defining the question, remember what people would want to read about. Pick a unique angle for the question. For example, if I were to do another SEO ego bait article like the one I showed you before, I’d focus on something like the best local SEO strategy or favorite 30 minute SEO quick win. It still focuses on SEO, but has a new angle that brings a good answer to people’s problems. Create a list of all the experts you want to contact. You can brainstorm the experts or search on Google. Make sure to define experts that have sites with high domain authority as well as social following. This will make the sharing as well as the linking more powerful. After you define the list of experts, find their contact information. Look in their personal websites, use LinkedIn, or simply ask them on Twitter. Then in just a couple of clicks you can send them all an email with your question otherwise you have to do it manually which can take some time. Finally, send the influencers an email with your question. If they don’t answer right away, wait a few days. Follow up two times more, and if they don’t answer, ask a different influencer. NinjaOutreach can automate this process end to end including all of the followups. You should get a response rate around 10-25%, maybe more if you already have a relationship with some of the influencers or if you are one yourself. Creating egobait articles is simple. The key to success is to structure your article for success and be organized with the pitching. Start by defining your headline. It must convey the value right away so people want to click on it. Then, define the question (or questions) you want to ask to the influencers. Make sure to make it super concise and actionable. Then, define the experts you want to contact. Finally, contact the experts with the question you previously defined. Once you publish your content, make sure you contact the experts so they help you promote it. Also, remember it’s all about the relationships; once an expert knows about your site, it will be easier for them to link to your site in the future (assuming they like your site). BONUS EGO BAIT STRATEGY: Take a look at this awesome link building tutorial that you can use to ego bait people in a different way. Creating content that drives attention has become harder and harder as time goes by. To create relevant and useful content, it needs to stand out. Using unique data to develop and enrich your content can help it stand out, command the attention it deserves, and attract the link your website needs. I designed 6x tests and signed up to 7x different WordPress hosts to test them. Now this cost a lot of money and time to do. I also shared data with my monthly income reports for the same reason. People like learning from successful people, by showing them how I do it others follow me and respect me. There is no step-by-step plan for this. Rather, it’s a process you need to follow. Does this article has any unique data? If not, try to add some so you give it more substance. You can make this as simple or as complicated as you want. That might mean running your own tests or aggregating the data of others. You could even take someone elses data and do a better job of presenting it with graphics/infographics/interactive charts/tables. This approach also works well with the NewsJacking strategy above because it’s often easy to compile quick reference data/infographics when a story breaks. If you have a respected brand in your industry or location, people likely write about you. When someone mentions you online, an opportunity to get a link appears. Unfortunately, many times people forget to link to your site when they mention you. Therefore, reclaiming your links is one of the easiest and most effective strategies you can use. In a moment I am going to show you an easy way to automate this but for now, I want you to understand the process. This returns a list of results that mention my domain name but excludes all the pages from my own blog. Be creative with your keywords; people may misspell your company’s name more often than you think. Make a list of all the sites you find where you have gotten a mention. Once you have created the list of websites, find the person who’s responsible for managing it. If you are in doubt, use the “Contact” page, but it’s better to go straight to the person who can actually fix the mention. But don’t forget to customise it first! I’ve seen you mentioned us on [PAGE]. By the way, I’ve seen you haven’t linked to our site. It’d be of great use for your readers if you added a link, so they can learn more about us. Here’s the link you can use: [URL]. Many people won’t answer you because it’s been a long time since they published the page where they mentioned you. That’s why it’s so important to respond fast whenever you get a mention without a link. To do this, set up Google Alerts so you’re always ready. My detailed tutorial will teach you all of the in’s and out’s of this. But in essence – every time you see you get a new mention alert, make sure to check there’s a link. Otherwise, contact the writer or editor of the website and ask for the link, using the template shown before. This way, you’ll be able to bring high-quality links to your site with no effort from your end. Link reclamation is one of the easiest link building techniques there is. You are basically getting links from people who already like you, so your pitching will be more effective than usual. To get started, look for mentions your company or site has gotten via Google. Whenever you find a mention without a link, contact the site owner asking for a link with my template. Finally, set up alerts with the help of Google Alerts to make sure never to miss any future mentions. This is one of the more quick win link building strategies that nearly anyone can apply instantly! The new year brings lots of new opportunities to your table. Pick 3x link building strategies you want to use this year. Then, put on your calendar the first step of the first tactic you’ve chosen to be done this week. Then just repeat the process with the other 2 link building strategies of your choosing. Before long, your website will have gotten dozens of high-quality links that will drive lots of traffic to your site. Which 3x link building strategies are you going to be focusing on this year? Thanks for sharing good blog post about link building strategy, I tried all those steps and its working…. I always look your website for new update. Go ahead…. Yes reverse engineering is one of my favorites and very easy to do! Reverse Engineering was highly effective for me in the last month! Thank you for this amazing post, Matthew. That is one of my favorite strategies! Hey, I just gone through whole article and I must say that it was worth reading. I’ve also ready these all 3 tips in many articles bit in depth and with example the way you presented loved it. Thanks for sharing and I would love to share it to my network. Thanks for the share Ravi! What you think which will be best for coupons website? Great piece of detailed content and thanks for sharing this wonderful post. What are you take on Blog Commenting. Keep bringing the awesome content. This is by far one of the best pieces I have read since I started my SEO domain. I even linked to it in my blog. After reading the Reddit backlink strategy, I would like to post this article in an SEO subreddit to build my karma:-) Great article and the new layout of the blog post, especially “This Section In Short” is very useful. Wow Matt, so much quality in every post you put out. Still getting through your awesome Wikipedia post. I think the guest blogging that is dead is the $5 guest blogging strategy that people pay to post on blogs marketed on fiverr. Google’s unnatural outbound links penalty has killed off the cheap blogging links by restricting the ability of certain blogs to pass pagerank without affecting the site’s visibility in google. Yes I would avoid those personally! Do you still recommend BuzzBundle as an effective traffic strategy? I was thinking about focusing on this one tool this year over the strategies you listed. Would be interested to hear your thoughts on this. Hello Matt I am happy to ready your blog like it. I will surely implement these all strategy and let you inform how much useful this all strategy. your all post really help me to make my blog stronger. Now I will definitely make a Reddit profile to boost my traffic. I tried guest posting and it works well. 2018 will be a great year for you! Oh forgot to mention. I recently accomplished the first step. Data-driven in-depth content. Your post has been of great help while writing it. Goes to prove knowledge you share is the real stuff and no fluff. Thanks for shearing very nice and useful link building strategies. Reverse Engineering and Local Citation is very easy and effective tactics for build high quality links. Can you suggest me a best hosting partner for my blog. As i am suffering huge loss of visitors. Youtube also changed the algorithms for ranking . Are you considering any upcoming tutorials/posts about the topic ? Awesome. Thanks, a lot Sir for this great article. I really love it! Thank you, so much for this useful strategies, it’s really mean a lot to me. I worked with the technique of guest blogging, malignantly in most of the time they asked for money. No free link. Hey, thanks for lots of good stuff you share. But I am stuck in one conclusion. It is on (No #9 Republish article/syndication article). The article has been published so before and has gotten so many impressions from visitors on my blog. If any other blog or site will republish this, will not get copyright content issue? There’s so many blog about how to get more back links and social shares and some of these blogs have a wrong information, finally I found one, I really love reading information about marketing even I’m a marketing staff already it is helping me to have more knowledge and to improve my self in the field of marketing. Thank you for sharing very well knowledge. What a joy to be here again after a bit gap. Great link building strategies you shared here. Some of them I am following, I am sure the new one I found is the intimation of the broken link to the blog manager. I am sure if we approach well we can be sure about a better engagement ahead. Syndication of content is yet another vital point I noted in this regard, I am bookmarking this post for my further reference and improvement in this aspect. Thanks, Matt for sharing this amazing post. Glad to have you back on board! We are very excited and inspired by this post to do a 150 guest posting within the next 6 months. I will keep you updated on our progress. Wow thats quite a goal! Outstanding article. You’ve clearly explained all the Link building strategies. I’ll implement these strategies in improving SEO of my blog. So informative, would love to borrow your brain! I am really looking into using guest posting as one of my link building strategies! excellent as always matthew! Great information. I am searching for this types of tips. Thanks for sharing. Awesome article as always. Number 1,2,4 is my favorite. I’ve never tried other methods. Will just give it a go with other strategies and see how effective they are. One of the best tactics that I like about Matthewwoodward is there email marketing strategy the way they design and make title I cannot resist myself to click that mail Keep it guys. Thanks for the share. It is important to stay on top of the link building game by getting to know the latest strategies. Your are sharing your article so much interesting ways. Your link building strategies improve more peoples seo work and upgrade them. i feel glad to read your article. keep posting ! No problem Michael, hope it’s helpful. No worries, I hope it proves useful to you! Thanks for your support Addy. Nice and Informative Content Sir. Thanks very much Victor. I hope you found a new strategy or two for link building. No worries, link building is so important for any site so I hope these strategies help you somewhat. Great article and information. Loved all the references and resources provided. Totally beginner at SEO, experiencing with link building, great tips of link building, keep sharing. Many backlinks generation tips explained in detail. Very useful blog, Gonna bookmark it for further use. Thanks Amit hope to see you again soon. Thanks Brad. Any new strategies there to try out? Thanks for sharing such an informative post. I have picked my best choice from above list to work on this year. Great news! Let me know how you get on! Its a great post with complete information. I even liked the examples you have shared along. Really helpful for me as its been only 2 months tht i have started blogging and i keep on searching for such article for guidance. Welcome to the world of blogging. Try out some of the strategies and the links will start rolling in! No problem and thanks for your thoughts! Glad you think so! Have you tried any out previously? No problem, glad to help! Any new strategies for you here? Thank you for providing such a piece of valuable information.I am visiting your blog on daily basis. this great information which is definitely going to help us. Good Stuff and I loved it. Thanks for shearing such a nice article. No worries, hope you find the strategies useful! Thank for sharing a very informative link building strategies. No worries, let me know which ones you end up using! Informative blog post. Love to read and appreciate you personally for such a precious word selection to convey your information. In one word i want to say, I like your interpretation. Thanks Alan, hope you find these strategies successful! Glad to help out! Link building is such an important part of any SEO strategy. No probs! Which ones will you be trying out first? I received your mail today evening, pointing out this page link with attractive link building strategies. We all know that 1 quality niche backlink is equal to 100 low PR backlinks, I didn’t read your entire article yet, I will follow your points and strategies about link building. I created my website Devbhumi Tourism related to travel and tourism last year and now we are in the top 5 travel agencies for “Uttarakhand Tour Packages”. I have many other plans ahead and want to be #1 for our services. I will go through your article smoothly and will create quality backlinks for my current and upcoming projects. Thanks for the tips. Hey Lalit. Great effort – keep focused on building links! Not that is what you call a pillar blog post awesome content! I am a long time marketer and you gave me some new ideas that i havent even thought of. Thanks very much Jay, glad to shed some light on a few new strategies. Are there any missing from the list that you find effective? Awesome For Link Building Strategy!, Thanks For Sharing. Reverse Engineering was highly effective tips. Thanks for sharing very useful tips. Yes, that strategy is a most effective one! Thanks very informative post ……. Thanks… which 3 strategies are you going to try out first? As always Matthew very informative I have made a list as it’s always beneficial to diversify your backlinking strategies, Kudos! Awesome stuff! Let me know which ones you find most successful. Yes… pick 3 strategies and try them out! No problem, pleased to help out! Impressive and interesting information. Thanks for shared and enjoyed to reading this post. Glad you found the post interesting! wow nice article you give important tips for growing traffic, thank you for this such a great post,i think i will learn blogging from you. No problem, there’s plenty of stuff to learn from on my blog. Happy to help! Which strategies will you be trying out first? Which ones are you going to try out? Very informative post really amazing.This really answered my problem.Thanks for this wonderful read.just buzzing after reading that. Very informative, rich in details and easy read. Hi Aamir, really glad I was able to solve your issue. Looking forward to hearing how you got on! Ohh man I can’t imagine the number of efforts it had taken for you to create this amazing blog post. I mean it got everything with pictures and facts. No worries Avneet. Glad you like the style of the post. No worries! Some strategies stand the test of time but great to add some new strategies for 2019! It’s a great option to get backlinks as you are providing something valuable to the website owner! Cheers! 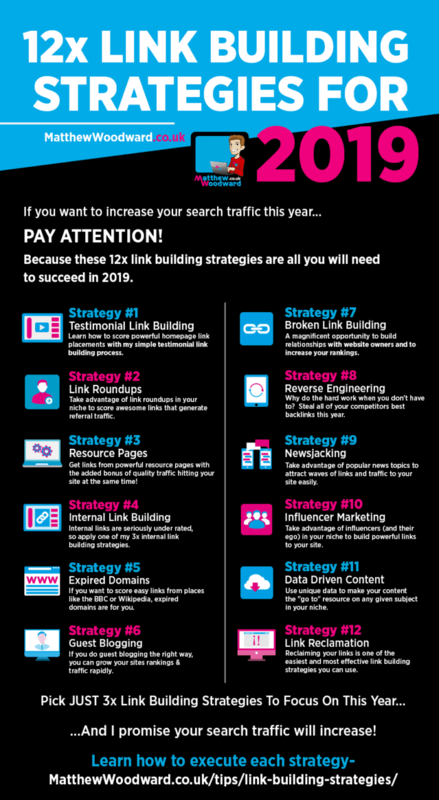 Link building is mega important so it’s great to be able to share the best strategies for 2019! Thanks very much. Any strategies you use that aren’t here? The content shared is really informative.I’ll definitely recommend my friends to go through your site and blog at least once. hii Thanks for this articles. No problem, which 3 strategies are you gonna try out first? Great! Let me know how you get on with those methods! I found the post on facebook and found it really useful. Some link building methods were totally new to me. Thanks for your research and collection of data this is helpful to all other SEO professionals. Even I bookmarked the post to read it again. Awesome news. I’m glad you found some new strategies to try out! Thanks very much! Where are you gonna start? Tks you so much .! Cheers! Which strategies will you be trying out? Nice article, Like Always Awesome Stuff. Cheers! Hope these link building strategies prove fruitful! Glad you found some new link building techniques. You have any successful ones I haven’t covered? Such amazing link building strategies. I am applying to my case. Thanks for sharing. Great news. Remember not to try all of them at once! Pick 3 and see how you get on. This is such an awesome article, Keep writing :) Keep helping people. Thanks very much, I’m glad you found my article too. I was doing wrong SEO all the time. Now I’ve checked these techniques on Google aslo. these are the best techniques in my point of view. These are for sure some great link building strategies which should be part of your SEO strategy. Great article on link building strategies Thanks, a lot for sharing..
Nice post, thank you for sharing the blog, its very interesting and informative blog. Thanks a lot for the tips. I did my blog thebroadlife.com for nearly a year but know nothing about link building. I could say this help me a lot! If you can check my blog please suggest me what to improve organic search. Thank you! Get started with link building right away! It’s really informative and really clear my doubts about link building strategies. Thank you so much..Keep the good work going. No probs! Hope you have plenty of ideas to getting going with now! Hello, This is a Excellent blog for rank a website. And thank you so much for give me this useful information. I have website and I wan’t to rank it in top. Now I can rank my website on top in Google. So, again thank you so much. Link building can be so complicated and cumbersome. Thanks for breaking it down in much simpler steps for me! No worries Arash, let me know which strategies are the most successful for you. I am happy to read your blog like it. I will surely implement these all strategy. Just pick 3 strategies to start with and see how you get on with them. Cheers Collins, hope it proves useful too! Cheers, hope the strategies are useful. Nice Blog! This will surely help us alot. Thankyou for sharing! No worries Arpit – happy to help. Great tips.Its really help me. Thank you for sharing this piece of information. The way of writing is commendable. Great article. Really awesome. Keep up the good work. Thanks very much, I fully intend too! Thanks a lot Kiran! You too. Lots of great stuff in here I will most likely have to reference over and over again. Hope you found a couple of new strategies to try out Arash. Good article. To spot the right site for link building too is a serious challenge for SEO experts. Thanks for sharing your knowledge and Useful Post . Thanks for sharing your knowledge and Useful Post. No worries, hope you found some new link building strategies to try out. This article is very helpful for link building work. Keep posting new new articles and keep helping us. No problem! Hope these strategies assist you! Thanks very much! Hope you picked up some new strategies! It is a great blog link building strategies and it’s informative which helps to understand about the building links in websites & very useful to all. Perfect! Glad you’ve found it useful! Thanks for your good information, I am sharing your blog.. Thanks for sharing this powerful information and it is really helpful for me. No worries Caley, hope you found some useful strategies for your niche. No problem. Which strategies are you going to try out? Hey Matt, this is an amazing guide, thank you for writing it. I especially like the internal link building and broken link building techniques. If I can get half the results Nikolay Stoyanov got, I’m golden. Thanks again. I’m going to share your guide on Twitter. Hey Nikola! Thanks very much and best of luck! Hope it gives your link building a boost! No worries! Which ones are you gonna try out? As a SEO specialist i appreciate you to publish a very helpful article . Salute ! Thanks very much! You have anymore link building strategies I may have missed? Hello Mathew, thank you for your valuable knowledge. Your posts are very valuable to increase my traffic and that of my clients. You always bring a point of freshness in this SEO. Regards form Canary Islands, Spain. That’s great to hear, thanks Isma! Though Google is very popular ( which I used everyday, Googling is the term), I still use Wikipedia when it comes in searching for other topics. Wikiping would be the right term. The most clear explanation I have ever read! Must read! Thanks for the article! Happy to hear it Mack! Amazing tips man! Thank you so much man! No worries! Hope they help your link building success! Hi, Matthew, I thing Private blog Network is a black hat technique. What you say. I would say putting labels on things is stupid. Thanks for sharing your good knowledge.Really I like it. Thanks, hope some of these strategies are the key to your link building success! Awesome guide Matthew. I think you have some of the best link building guides anywhere online. You are a great teacher and from the looks of it, one hell of a link builder too. Pleased to hear it… which strategies have you decided to use? Nice Blog More Use full Detail In This Blog. Link build strategy is vital role play in SEO. It is very difficult to create link because it depend on third party and I think guest posting will be best way to create link. It certainly is a good way to get links placed! Thank you. Hope you have success trying out some new link building strategies. No problem, which strategies are you going to try first? Thank you for giving us the most useful information. Glad I could help! Hope you use these strategies to develop a fantastic link building strategy! Good luck with your blog Ranjeet. Yes… the higher authority the website has then the stronger the link. thank you man this blog was so long and useful for me. Hope you got some good link building strategies to work with now Milad! Cheers Abigale! Do you have any more methods you consider worthwhile?